Chaidh Bìoball a bh' aig ministear Albannach ainmeil a chuidich còrr agus 2,000 saighdear aig àm an Dàrna Cogaidh a thilleadh chun na seann eaglaise aige ann am Paris. Bha an Dr. Urr. Dòmhnall Caskie, à Ìle, na mhinistear ann am prìomh bhaile na Frainge nuair a thàinig na Gearmailtich ann an 1940. An àite tilleadh a Bhreatainn, rinn e obair mhòr a' cuideachadh shaighdearan mus deach a chur an grèim. 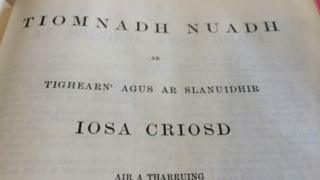 Sgrìobh e leabhar - an Tartan Pimpernel - mu na thachair dha. Tha an eaglais Albannach ann am Paris a-nise a' cruthachadh taisbeanaidh mhaireannaich mun Urramach Caskie, agus tha mac a bhràthar air Bioball Dhòmhnaill, a chaidh fhàgail aige mar dhìleab, a thoirt dhaibh. "Tha mi a' smaoineachadh gu bheil e air leth freagarrach gu bheil taisbeanadh mar seo ann, agus tha e iomchaidh cuideachd gur e am Bìoball Gàidhlig aige a tha iad a' cur dhan taisbeanadh," thuirt an Dr. Urr. Ruairidh MacLeòid. "Chan eil fhios dè an cuideachadh 's a' chofhurtachd a thug am Bìoball Gàidhlig sin do Dhòmhnall Caskie ann an làithean doirbhe na bheatha. "Tha e math gu bheil an comharra seo ann air gaisgeachd an duine," thuirt e.